Residents of O’Neill Hall paddle their handmade boat for the 25th annual Fisher Regatta. 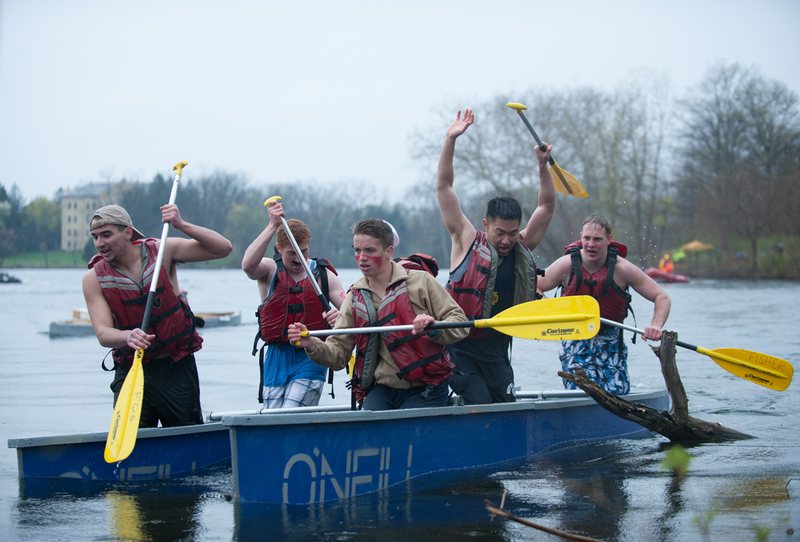 Fisher Hall hosted its 25th annual Regatta on Saturday afternoon at Saint Mary’s Lake. Despite temperatures in the 40s and blustery winds, Regatta commissioner Bill Cheeley said turnout was higher than ever. Approximately 45 boats registered to compete in the racing bracket, most of them sponsored by dorms across campus. According to Cheeley, this is a record for the Regatta, which usually has around 30 different student-made boats. The Regatta is noted more for its fun antics and displays of dorm pride than its serious competitive nature, Cheeley said, highlighting that roughly half the boats sink during their races every year. Regatta festivities start well before the actual race, Jbara said, with Fred and Sally Week commemorating the two donors who underwrote construction on Fisher Hall. The annual tradition of the Regatta began 25 years as the brainchild of Fisher residents who wanted a major event to celebrate their dorm while bringing campus together. “I think it started off as a joke. Why don’t we build boats and go race them out on the lake? And from there it just kind of took off,” Jbara said. Despite these humble origins, the Regatta has become a huge event on campus and requires a substantial amount of work. Cheeley said the process to prepare for the Regatta began as early as December of last semester. With a staff of 22, Cheeley had responsibility for a range of functions essential to the Regatta including fundraising and advertising. Cheeley said all proceeds from the Regatta are going towards a fund to re-floor the gym of St. Aldabert’s, a local Catholic school and parish. In prior years, Cheeley said the Regatta raised money for a variety of causes such as the Brother Andre House. Cheeley said this year the rector of Fisher Hall, Rick Mazzei, set a goal of raising $5,000. Cheeley said he expects the Regatta committee will meet or exceed their goal, but they don’t have a total yet because they will continue to sell bro tanks through the end of the semester. Jbara said he enjoys seeing how the Regatta impacts freshman who get to experience it for the first time. “The freshmen came in and we talked about the Regatta all year, but until this week they didn’t understand what it’s about and the amount of brotherhood it builds,” Jbara said.